Ocean racing is not for the faint-hearted especially when it is along South Africa’s notoriously difficult East Coast in a yacht. But the Vasco da Gama Ocean Race on South Africa’s East Coast has stood the test of time and has been going since 1968. This year is the 45th running of the race. That’s a massive achievement as overnight and long distance racing in our country has become almost non-existent in recent years. A total of 17 yachts have entered in this years race and organisers are expecting to breach the 20 entry limit by the time that late entries close on 15 April 2016. This year’s race will start on Saturday 23 April – the course being from Durban to Port Elizabeth – a distance of 400 nautical miles. The race is known for the tactical decisions skippers and their navigators have to make. Many refer to it as a ‘navigator’s race’ due to the demands on the navigators as they have to weigh up the choice of course as the inshore option brings the possible land breeze and flatter water into account, whereas the offshore leg often brings with it a favourable current and stronger winds. Despite its toughness, the race has a long, proud history and tradition, as do the host Clubs, the Point Yacht Club and the Algoa Bay Yacht Club. 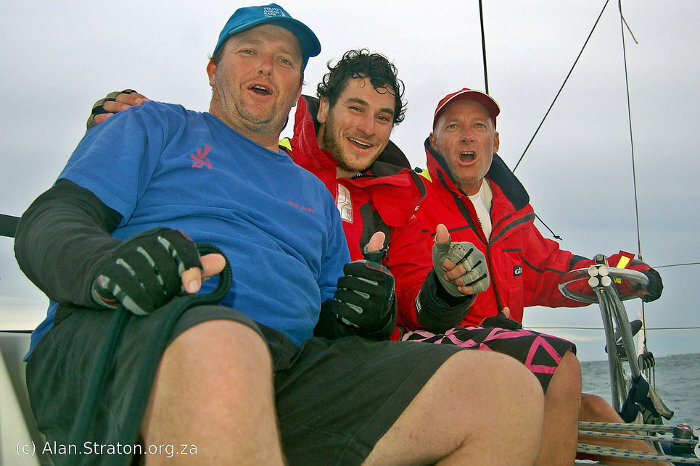 The first boat over the finish line last year was Gumption, skippered by Nicholas Mace. The overall handicap winner was AL Mount Gay Rum, skippered by Rob van Rooyen & James Largier. The PHRF Racing class was won by Star Spirit, skippered by Willie Pretorius. The Multihull class was won by Nomad, skippered by Craig Deverson. Last year the Algoa Bay Yacht Club welcomed the fleet in a warm and friendly manner. A large reception committee welcomed each boat, and as they stepped off the marina onto the club lawns there was a warm fire welcoming everyone, as well as cold refreshments and a hot breakfast all sponsored by SPAR Eastern Cape. The hot breakfast on arrival, irrespective of the time of day or night, is a tradition in the Vasco da Gama Race. It’s a wonderful touch after a tough race. This year the yachts will once again be equipped with YB Tracking satellite trackers thanks to Phil Gutsche of GIMCO (Gutsche Investment & Management Company), who has again generously sponsored this aspect of the race. The YB Trackers gave absolutely phenomenal coverage and exposure during the 2015 race. Not one single tracker missed a beat, and every boat’s details were updated on time every time. Plus the sailing information they provided was interesting and very relevant. These trackers are used by many of the top international races around the world. Each vessel will be equipped with a YB Tracker prior to the race start. Transmitting every fifteen minutes, the trackers will relay several packets of data, including GPS position, speed and direction. All the data goes through the Iridium satellite network to YB HQ servers and then onto the race player. This is done in a matter of seconds so all friends and family left on shore can easily follow the progress of the entire fleet, or just an individual boat. Previous: Did you sail the RYC Interschools in 1976? Next: Why the Port St Johns sunrise?